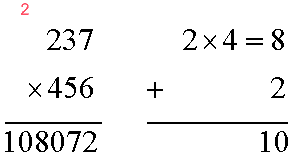 This article will show how to do multiplication of two three digits numbers from right to left. Consider 234 × 456. Step 1: Multiply the last digits. Write 2, carry 4. 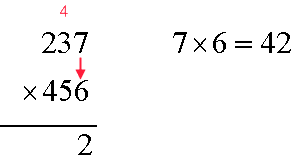 Step 2: Cross multiply the one and the tenth, and add them together. We get 53. Add the 4 that we carry to 53. We get 57. Write 7, carry 5. 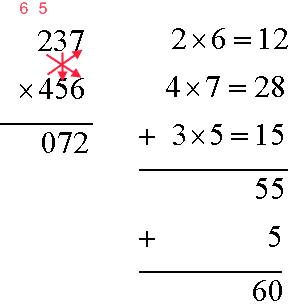 Step 3: Multiply all digits, like in the figure below. We get 55. Add the 5 that we carry to 55. We get 60. Write 0, carry 6. 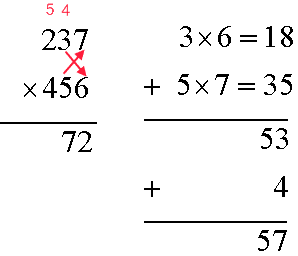 Step 4: Finally, multiply the two left digits. We get 22. Add the 6 that we carry to 22. Write 2, carry 2. Step 5: Finally, multiply the left digits. Add the 2 that we carry to 8. We get 10. 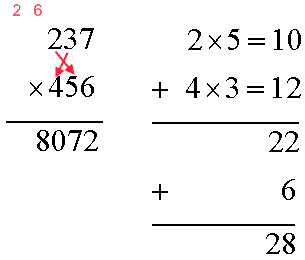 Write both numbers. Therefore, the answer is 108072.